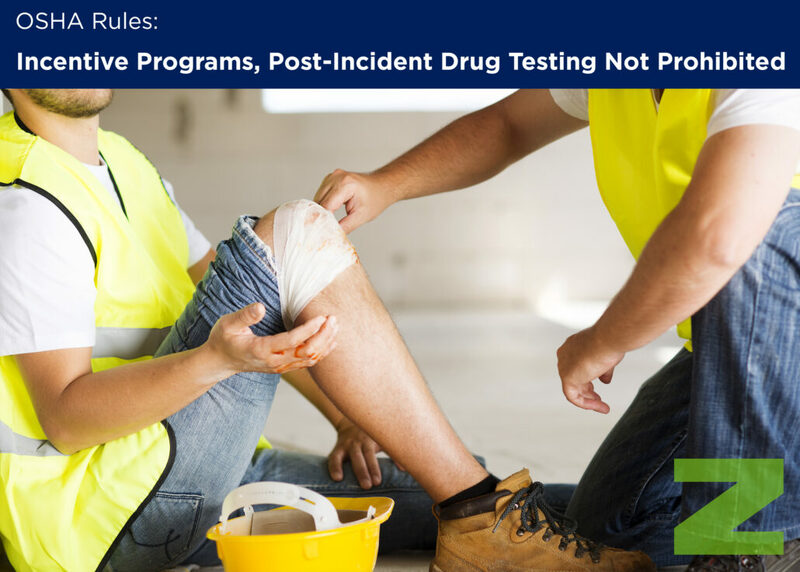 Post-incident drug testing and safety incentive programs are not prohibited under the anti-retaliation provisions in OSHA’s electronic record keeping rule, the agency has clarified in an Oct. 11 memorandum sent to regional administrators and state designees. In an October 2016 memo, OSHA explains that drug testing employees who report injuries or illnesses is prohibited unless an employer has an “objectively reasonable basis.” In addition, the agency will “only consider whether the drug test is capable of measuring impairment at the time the injury or illness occurred,” and will “consider this factor for tests that measure alcohol use,” but not tests for drug use. According to the preamble to the 2016 regulation, “evidence in the rule-making record shows that blanket post-incident drug testing policies deter proper reporting,” and indicates employers might run afoul of the rule’s anti-retaliation provisions with such actions. The other examples include random drug testing, testing unrelated to reporting an occupational injury or illness, testing under state workers’ compensation laws, and testing under other federal laws such as a Department of Transportation rule. · Incentive programs rewarding employees for identifying unsafe workplace conditions. · Employee training programs that reinforce reporting rights and responsibilities and emphasize an organization’s anti-retaliation policy. · Taking steps to accurately evaluate workers’ willingness to report injuries and illnesses. In a post on his “Confined Space” blog, former OSHA Deputy Assistant Secretary Jordan Barab questioned how that would work, providing a possible scenario. “A worker suffers a serious cut on his hand while working on an unguarded machine the day before the lottery for a new riding mower ends,” Barab wrote. “Fearing that his co-workers will hate him for causing them to lose a chance for the prize, he sticks his bloody hand in his pocket and heads to the local urgent care to have it sewed up, telling them that he did it while working on his car. To read the Oct. 11 memo, click here.